Two teenage sisters are put in the care of their quirky Aunt. Part of David Puttnam’s disastrous reign at Columbia Pictures, this little seen slice of Americana now takes a deserved bow on Blu-ray. It has the feel of those middlebrow '80s literary adaptations, such as The World According to Garp, but eschews eyebrow raising quirk for something a little more steely and substantial. Teen Sisters Ruthie (Sara Walker) and Lucille (Andrea Burchill) are raised by a series of elderly relatives after their mother commits suicide. Finally left with Aunt Lilly (Christine Lahti), who appears at the doorstep, possibly a hobo or escaping trauma from her past. Her quirky demeanour and quixotic nature endear her to the sisters, who due to a childhood of isolation and seclusion are unusual forces of nature themselves. Housekeeping is a slender film, but one rich in character and visual poetry, full of eccentric segue ways into the history of the town of Fingerbone and the history of the family. The visuals are ravishing and Michael Coulter's cinematography is a real highlight of this restoration. It also scores points over the director’s previous work by not having an irritating Mark Knopfler score dominating the mood. Such is the mastery of environment and visual tone that there is a danger the characters could get lost among the pictorial beauty. Forsyth however is a consummate director of actors, and in Walker and Burchill as the two teens, he gets some of the best performances from young actors in American cinema. There is no showboating or the wise beyond their years acting with a capital A that is the default setting for teenagers in Hollywood films. These kids are gangly and awkward, neither too pretty nor dressed down ugly. These are young adults who have spent their early years in a traumatic and difficult environment. The scars may not be visible but the trauma has been internalised. Ruthie and Lucille are the eyes through which we see Fingerbone, the world opening up as their personalities and sense of adventure or need to fit in increases. If the environment sometimes seems strange or mannered it is because that is how the environment seems to them, cloistered and cut off as they are until the arrival of Aunt Lilly, who has a transforming impact on the lives of her two nieces. Any dangers that Lilly will be a quirky spoonful of sugar Mary Poppins figure are quickly dismissed. Lilly is a distracted presence; you’re never quite sure if she is going to do a runner at the earliest available opportunity, and being potentially homeless and with psychological issues you are never entirely sure if this is an adoption of convenience. Lahti works wonders in a role that could have been annoying and an excuse for showboating histrionics. There is always something reigned in and distracted about her. A hoarder with a laissez faire approach to housework and love of alfresco napping, she could just as easily be an inhabitant of Grey Gardens with Big and Little Edie. In its own small way, Housekeeping is quietly devastating. Is Lilly looking after the sisters? Or are they just about keeping her from breaking apart? This is a film about emotions unexpressed but writ large on the faces of the protagonists. Lilly hints at past traumas that are never explained; she may also have the best interest of her charges at heart but is she an actively dangerous part of their lives, damaging their development into adulthood? Even the sisters’ relationship doesn’t survive as Lucille’s desire for a normal life leads to estrangement and eventual departure. A small work that packs a big punch, Housekeeping is slow moving and stately but always compelling. See it for a never better Lahti and wonder why mainstream Hollywood seems incapable of making low key mid budget films of this ilk anymore. A selection of extras that add real depth to the film, although a little on the way in which it was unjustly sneaked into a few theatres could do with further elucidation. The meat of the supplements is a 40-minute interview with Forsyth explaining the development process and how not to deal with star names (Diane Keaton was originally, attached then bailed) and the way in which Cannon films deal with finances. Unfortunately, the audio only BFI interview repeats the same anecdotes and has the disadvantage of severely muffled questions from the audience. Short interviews with author Marilynne Robinson, Director of Photography Michael Coulter and Editor Michael Ellis round off the package. The trailer is also a shocker, taking a subtle and emotionally wrought piece of filmmaking and turning it into a bipolar Mrs Doubtfire. Picture gallery and the usual high quality booklet featuring a new essay by David Archibald rounds things off. 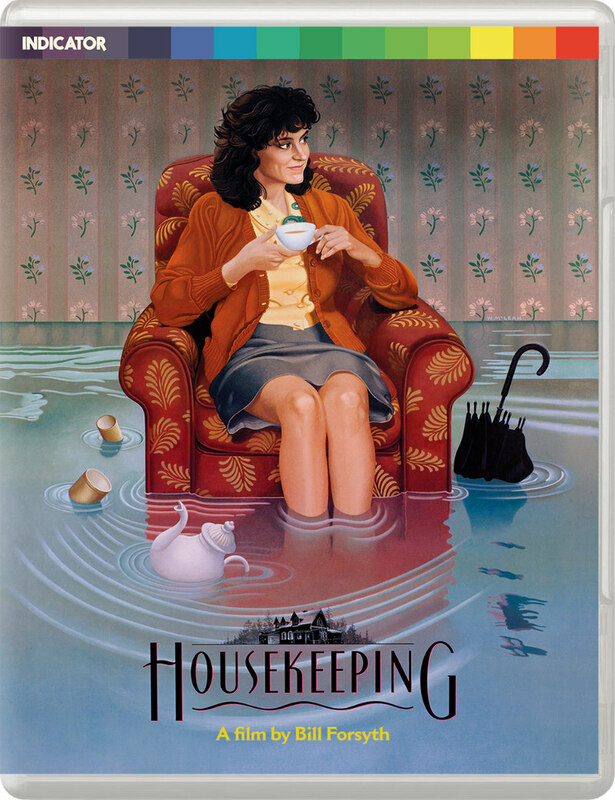 Housekeeping is on blu-ray now from Powerhouse Indicator.